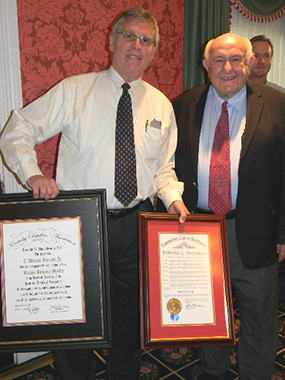 Members of the Kentucky Distillers’ Association today installed Bill Samuels, Jr., as a Lifetime Honorary Member of its Board of Directors, a title bestowed to only four other people in the group’s 131-year history. Samuels, who is retiring Friday as president/CEO of Maker’s Mark Distillery, is the longest-serving member of the KDA Board since its founding in 1880. He joined in 1968 as the distillery’s alternate director under his father, T. William Samuels Sr. The KDA ceremony took place at the picturesque Maker’s Mark Distillery in Marion County, with all of the distillery’s employees, distinguished executives and legendary Master Distillers of Kentucky’s signature Bourbon industry in attendance. “The only person more surprised than I am about receiving this great honor would probably have been my father, who I think always suspected that I might not be cut out for this business,” Samuels said.